I found Milla on an Anime server! 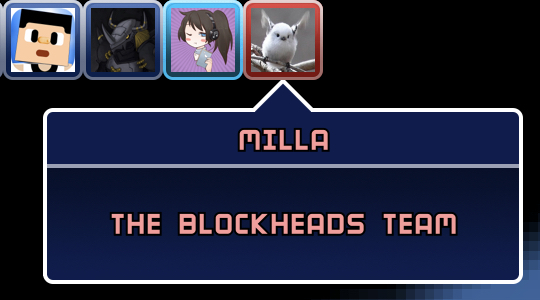 I wouldn’t expect milla to say “yo yo whaddup?”. If she ever says that, I’ll call the cops. Has anyone ever seen NoodleKing? That is the Noodlecake super mod on TBH. Zhaus joined Rabbithole back in BlockServer though, I was not there. Noodlecake probably only online in the beta app when he has to test something to fix it. Shows what I know, I didn’t realise ASYC was so famous I should have been fan girling and had no idea. I’ve seen milla once and ASYC many times, although before she had her mystic red border. Never seen Dave in-game. It’d be either ASYC_NZ or MILLA, as we’re the only ones active. Dave doesn’t really go on. Oh, that must have been a while back. He’s not worked on the game for ages. He developed the cloud platform, and I think he came back and did some more stuff with it a couple of years back. When you mean 3rd party chat clients, do you mean apps like discord? Yes, that includes Discord, and any other chat app. There was going to be a MessageBot extension to sync Discord chat with in game chat, but since that put chat outside of the game’s channels, it wasn’t allowed. If chat occurs while the app is active on screen it has to be logging to our network. If you have to leave the game to use it, then it’s fine. 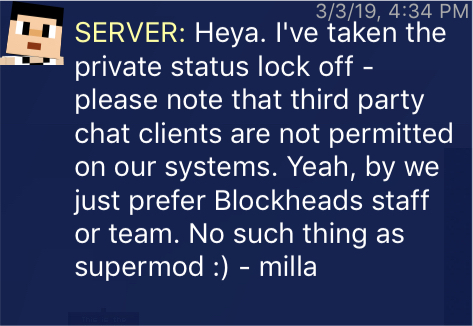 If you minimise or close The Blockheads you are no longer in our app. That chat script opened a window out of the WM, while keeping the game on screen underneath it. This means people were still technically in our game, but nothing said or done was being logged by us. 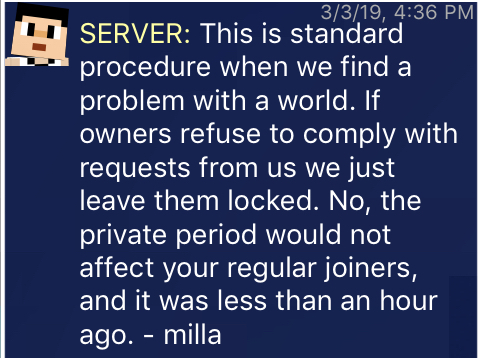 It’s not same reason we barred the idea of in-game chat being exported, Bib, but it’s covered under the same set of concerns: privacy, safety, legalities, and liability. We need to be able to ensure all interactions are appropriate and are not going who knows where, or coming from predatory persons.